Skip the grill, these pork ribs are the way to go. In a small bowl, stir together garlic powder, onion powder and Cajun seasoning. With fingers, rub seasoning mixture all over the ribs. Spray a shallow foil-lined baking pan with nonstick cooking spray. Place ribs in baking pan then top with onion slices. Cover baking pan with foil, then bake until tender, about 1 1/2 hours. Remove baking pan from oven. 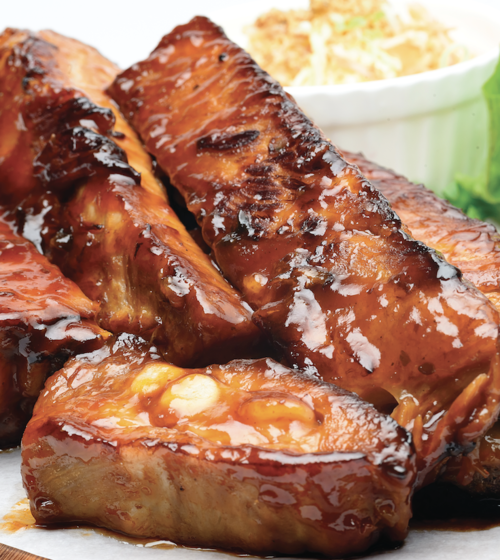 Remove foil cover then brush ribs with barbecue sauce. Bake for an additional 15 minutes, or broil for 5 minutes.